"My own motivations in writing Journey to the Heart of Aikido are simple ones: gratitude and service. I believe the best way to repay the generosity of Motomichi Anno Sensei, and all of the Aikido teachers who have shared their inspiration with me, is to pass it on. I dedicate Journey to the Heart of Aikido to the hope that the integrated spiritual practice of Aikido will play a positive role in the evolving future of humankind. Aikido 6th dan • Chief Instructor and Executive Director of Aikido of Santa Cruz, a non-profit, educational organization since 1982. Morihei Ueshiba, O-Sensei, established Aikido as an art of peace to bring harmony to humankind. The teachings of Aikido have guided the life of Motomichi Anno Sensei. People around the globe have been touched by Anno Sensei's teachings and peaceful practice. "It is my hope that this book will present the philosophy of Aikido in a way that makes it accessible to many people. My sincere wish is that the book will inspire you to a deeper understanding of the heart of Aikido – the heart of harmony, love and gratitude – and illuminate the future with the light of new hope." 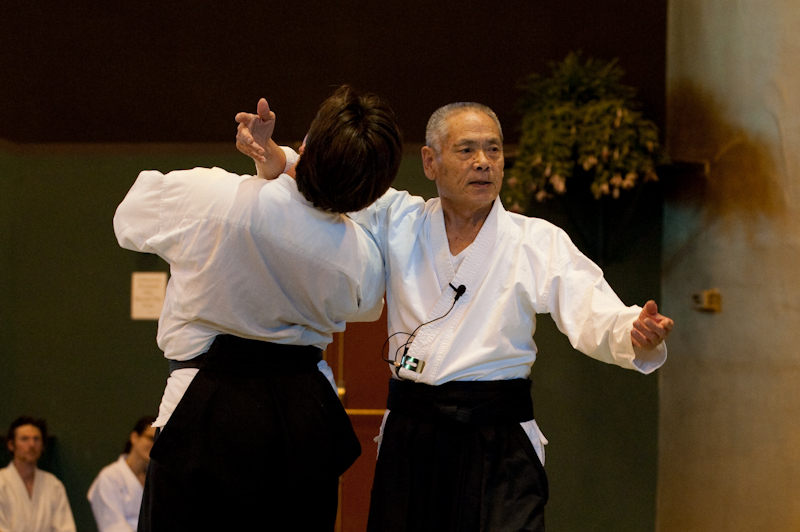 MOTOMICHI ANNO is one of the highest-level teachers of Aikido in the world today. An eighth-degree black belt since 1978, he is one of the few remaining Japanese master-teachers who received direct instruction from the founder of Aikido. Anno Sensei’s simple wisdom, humility, and heart have inspired thousands of students and teachers in Japan and abroad. war determined to do something positive with his life. When he was twenty-three years old, Anno Sensei became a student of the founder of Aikido and began a lifelong devotion to Aikido as a practice of peace and the cultivation of the heart. "This book is a treasure of wisdom from the heart of a true peacemaker." "The sublime life and teachings of Morihei Ueshiba are authentically presented in Journey to the Heart of Aikido through the lifelong training of Motomichi Anno as well as Linda Holiday's amazing dedication and research. As one who studied with the Master in his tiny nightly class right after World War II, I am overjoyed that the essence of what I witnessed and learned in Japan's countryside sixty-five years ago is now available to the public in the Western world." "This book is a gift for all who wish to develop greater spiritual understanding of Aikido, its universal application, our potential to embody the principles, and the amazing abilities of its founder." "A monumental work... entertaining, insightful, at times humorous, but always compelling. Over the years, Linda Holiday has become intimately acquainted with the culture of Japan to a level few foreigners attain. I wholeheartedly recommend Linda Holiday's book to every Aikido practitioner and martial arts aficionado. It will not fail to inform and inspire, and is surely destined to become a classic." "Through his teachings, Anno Sensei guides us with a benevolent smile and the deepest humility to the 'heart of aikido.' His reflections on all aspects of practice are very rich and will surely answer all the questions we may ask. Journey to the Heart of Aikido is also a beautiful testimonial to fidelity: that of student to teacher, and teacher to O-Sensei." "Aikido’s founder, Morihei Ueshiba, established Aikido as a way of harmony, an art of peace, a path of light. Motomichi Anno, one of the last remaining direct disciples of the founder, and his student Linda Holiday have devoted their lives to preserving Morihei’s legacy. Journey to the Heart of Aikido presents Anno Sensei's simple, yet profound teachings, together with an inspiring account of his life and his experiences with the founder. This is a rich, valuable book, lovingly put together in the true spirit of Aikido." "The teachings of Aikido are truly universal, and thus this book is for everyone. Anno Sensei's lifelong journey along the path of love and harmony is an inspiration to us all. I praise Linda Holiday for her dedication in bringing this treasure to the world, as I know it will help guide countless readers on their path to personal and global peace." Journey to the Heart of Aikido presents the teachings of Motomichi Anno Sensei, one of the few remaining direct students of Morihei Ueshiba, the founder of Aikido. Author and translator Linda Holiday—herself a senior instructor of Aikido—brings to life the intimacy of this communication through translated discourses on the deep practice of Aikido and candid dialogues between Anno sensei and Western students. With simple authenticity and eloquence, Anno Sensei conveys Aikido's essential spirit of harmony, gratitude, purification, and love. Journey to the Heart of Aikido offers spiritual teachings relevant to all contemporary seekers, touching a wide range of themes such as the meaning of martial arts, the integration of body and spirit, the truth of interconnectedness, and the practice of peace, offering all readers insight into the profound spiritual questions at the heart of life.